The Rock Project is the UK’s premier school of rock and pop for young people aged 7-18. 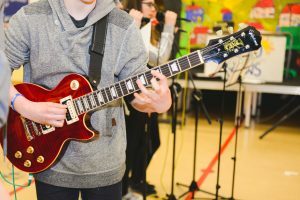 Whether you are a complete beginner or you already play, our aim is to mentor you on either the guitar, bass, drums, keyboard or with singing lessons and to get you playing in bands and performing on stage at our rock concerts. The days of learning a rock instrument and playing it on your own in your bedroom are gone. Join The Rock Project today and we will have you rocking out on stage in a band!